Tanley is the 11 year old daughter of Scott and Mindy Bebout from New Market. She is a sixth grade student attending Clarinda Middle School. Throughout the school year she is involved in soccer, volleyball, basketball, and track. This year she is participating in league volleyball as a member of the Iowa Spikers team. Tanley is active in 4H, where she shows horses and poultry and is in the photography, clothing and fashion projects. 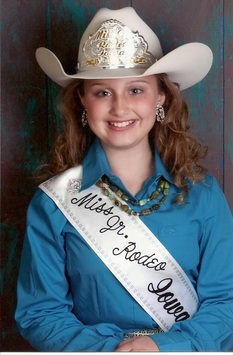 Miss Junior Rodeo Iowa is Tanley's first title and she is excited to be representing the state of Iowa and can't wait to meet new people and promote to sport of rodeo.